I had never, ever heard of Kipferls before. Then, in two weeks they came into my life twice! First, my friend Priscilla made some in the Culinary School Pastry Arts program she is enrolled in. I didn’t try one because I don’t like nuts. I dislike nuts so much that the name of the cookie didn’t even register. Then I read “The Book Thief” and Kipferls are important in one chapter. Since I was hosting book club this month and since the author had contributed his mother’s recipe for Kipferls to “The Book Club Cookbook” that my friend Kayte gave me for my birthday last year, I decided to make the cookie. I had to do a Google image search to see what they looked like! Then came the hunt for Hazelnut Flour. It’s out there. I found it at Sprouts. I was shocked by the price. I told the cashier that there must have been a mistake. She said she doubted it. I asked her to call for a manager for a price check. YEP. She was right. There was no mistake. It’s $16.95 for a 14 oz. packet of Hazelnut Flour (aka Hazelnut Meal). After creating such a fuss, and with my book club in less than seven hours, I bought the dangblasted expensive and pitifully small bag of Hazelnut Flour. BTW, you don’t have to buy this flour to make these cookies. 1. Make your own. Preheat oven to 350°F. Place 6 ounces (1 1/4 cups) of shelled hazelnuts on a baking sheet in a single layer. Bake 8–10 minutes, stirring occasionally until the hazelnuts are fragrant and brown. Remove the nuts from the oven and let cool slightly. While still warm, though, fold the nuts inside a clean kitchen towel and rub vigorously to remove their skins. Place skinned nuts in a food processor fitted with the stainless-steel blade, and process until they are finely ground. 2. Substitute Almond Flour or Almond Meal for the Hazelnut Flour. Almond Meal is about one-third the price of Hazelnut flour. 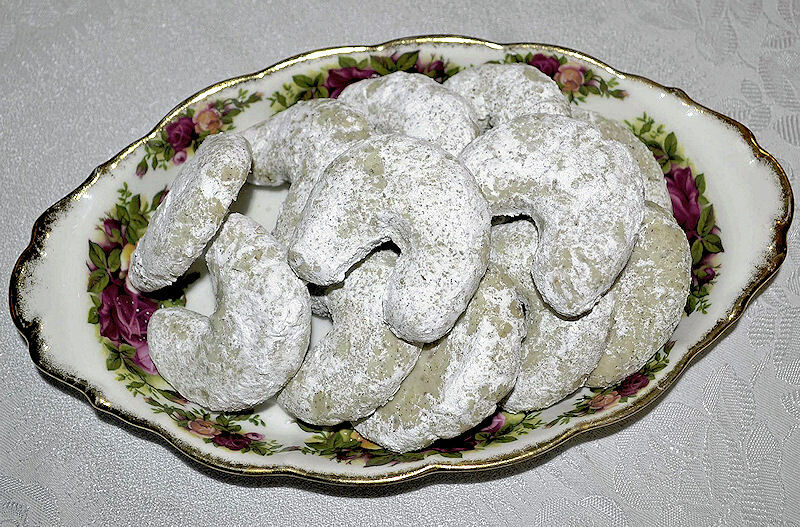 My German friend Karin said she always makes her Kipferls with Almond Meal, but her German relatives grind their own nuts. Make the vanilla sugar first. Place the powdered sugar with the chopped up vanilla bean in the bowl of a food processor fitted with a metal blade. Process until the vanilla bean has been incorporated into the powdered sugar, several 10 second bursts. 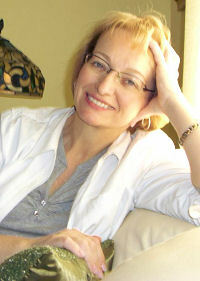 Place a fine meshed sifter over a small bowl and sift the powdered sugar to remove the unblended pieces of vanilla bean. Pour vanilla sugar into a large Ziploc bag. Set aside. Preheat oven to 350°F. Spray two baking sheets lightly with cooking spray or line with parchment paper. Combine all purpose flour, hazelnut flour/meal, and granulated sugar in a large bowl. Cut butter into 1/2-inch pieces and add to flour mixture. Scrape the inside out of the split vanilla bean and add to bowl. With an electric mixer, mix dough for 3-4 minutes or until a soft dough is formed. Pinch off small pieces of dough (1 T; 1/2 oz; 15 grams) and mold gently between your palms to form 3-inch ropes, thicker in the middle and tapered at the ends. This took a bit of doing to master. I rolled the dough to the length of my three middle fingers. I rolled the dough a bit more firmly with my ring and index finger so the ends of the dough would be thinner. Fashion each piece of rolled dough into a crescent shape and place onto the prepared trays, see picture above. Bake in preheated 350º oven for 15-20 minutes or just until the cookies are beginning to turn brown. Mr. Kusak says that once the Kipferls are brown, they are over cooked. Remove cookies from oven. Cool just slightly and then toss into the Ziploc bag with the vanilla sugar–tossing the cookies while they are still hot creates a slightly melted-on, and truly special coating. 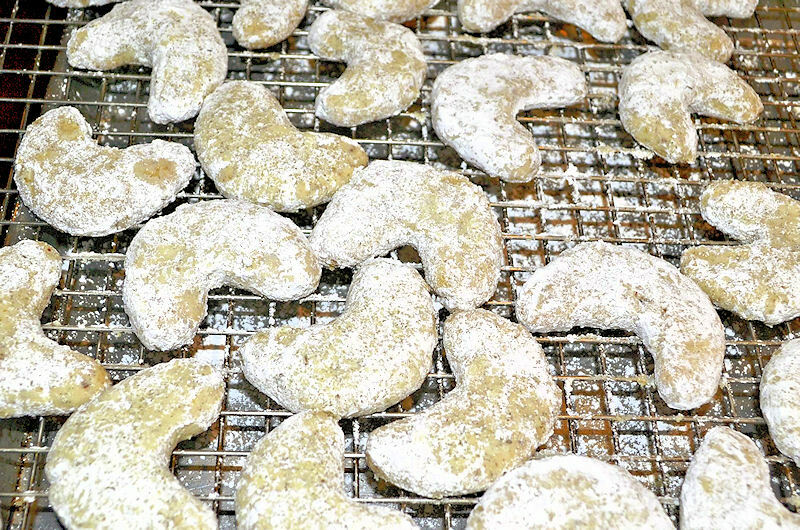 Toss cookies in vanilla sugar. Remove cookie to a cooling tray and repeat with remaining cookies and vanilla sugar. If you have vanilla sugar left over, you can re-coat the cookies. Let cool completely before eating. The cookies will crisp up as they cool. I hope you enjoy the World’s Most Expensive Cookie! They ARE good and worth the cost and the effort. Thanks for stopping by my kitchen today! PS…I am making another batch of these cookies to take to a Tahoe retreat this weekend. One bag of that dangblasted expensive Hazelnut Flour does make three batches of these cookies…AND, Costco sells vanilla beans now. Note my friend Sally’s point, put the vanilla beans in the powdered sugar as soon as you get them. Once you are ready to make the cookies, remove the beans and use as outlined above. The benefit is that some of the essence of the vanilla beans will have soaked into the sugar…yummmmm. Once a year I host a book club meeting at my house. My night was last night. The book was “The Book Thief” so the theme was German food. Thanks to input from the Internet, I decided to make a “Black Forest Torte” for dessert. I found a recipe posted on Food.com by a “real German lady”, and decided to make it, with no advance practice session (I know, living on the edge!). I made a few changes to the recipe, of course: I used pitted sour cherries from a jar, rather than fresh cherries (they’re not in season right now), and I used butter, rather than shortening, in the cake batter. I also made two 9.5 inch cake layers instead of the three 9-inch layers specified in the original recipe (I really dislike 3 layer cakes). I modified the mixing method for the cake. I used espresso powder, rather than cold brewed espresso, in the filling and adjusted the amount of Kirsch in the filling as well. I upped the whipped cream frosting by 50%. Now, if you make this cake, you’ll need to start three days in advance and, please, DO make this cake! Day 1: Drain the cherries and soak in Kirsh. Day 2: Make the chocolate layer cakes, soak the cakes in the Kirsch drained from the (now boozy) cherries. Make the filling and assemble the layers one on top of the other. Refrigerate overnight. Day 3: Make the chocolate curls and the whipped cream frosting. 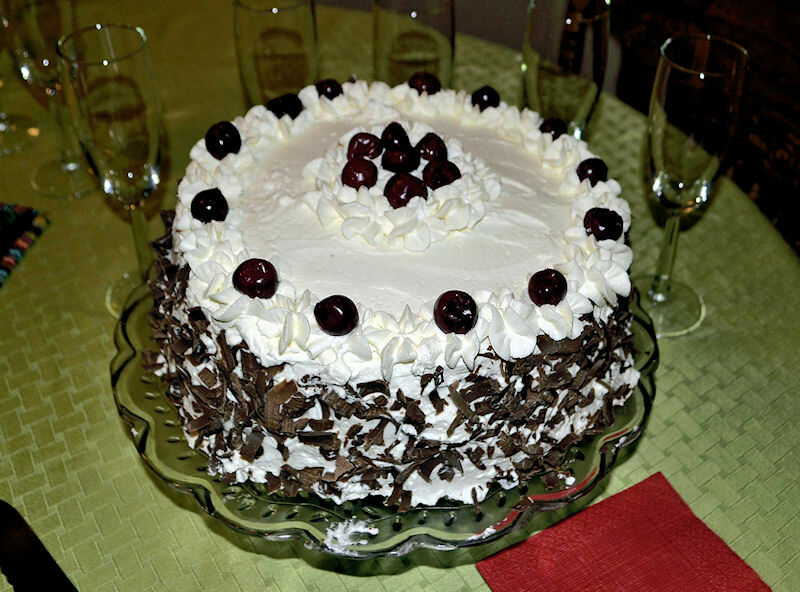 An hour or two before serving, decorate the cake with the whipped cream, reserved cherries, and chocolate curls. Serve! Day 4: The leftovers are yummy! 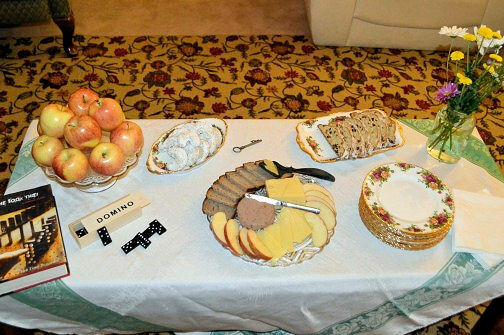 I called four friends over for tea, and they all accepted, enjoyed the cake, and took slices home for their husbands! (So far, I have cut sixteen slices from this cake, and there is one slice left in the refrigerator for my 23 year old twins to fight over. Drain the cherries then soak them in 1/2 cup Kirsch overnight. Discard the cherry juice UNLESS you want to make a non-alcoholic cake. If you want a non-alcoholic cake (like, if children will be eating it) use the cherry juice from the cherries instead of the Kirsch and proceed as outlined below. Drain the cherries from the Kirsh. RESERVE the liquid! Most of the liquid will be poured over the hot cakes. Reserve 2 tablespoons of the liquid for the filling. Line the bottom of two 9 inch round cake pans with parchment. Spray the sides with “Pam for Baking”, or grease with a bit of butter or oil. Sift the dry cake ingredients together and set aside. With an electric mixer beat the shortening to soften, then add the sugar. Beat for six minutes or until the shortening-sugar mixture is light and fluffy. Add the eggs, one at a time and mix well. Stir in the vanilla. Add one-third of the dry ingredients to the sugar mixture and beat to combine. Add half of the buttermilk. Beat to combine. Add another one-third of the dry ingredients and beat to combine. Add remaining buttermilk. Beat to combine. Finally, add the last of the dry ingredients and beat well. alternately with the buttermilk and mix well. Bake in preheated 350 oven for approx. 25 minutes or until a cake springs back when touched. Let the cakes cool in their pans. Make the filling. With an electric mixer beat the butter until light and creamy. Add the powdered sugar, salt, espresso powder, and 2 tablespoons Kirsch-Cherry juice and beat well for 3 or 4 minutes. If the filling is too thick add some extra Kirsch, cherry juice, or cream (add only an extra 1/2 tsp. at a time). The filling should be spreadable, but firm. Place the base layer on cake plate. Spread filling over top, then cover with drained cherries (save some good, firm, pretty cherries to go on top of the cake as decoration). I took the time to place each cherry in concentric layers, which I think helped with the stability of the cake. Add the second cake on top of the filling and cherries on the first layer. Push down a bit to secure a firm fit between the layers. Cover the cake and let sit in refrigerator overnight for the flavors to meld. A few hours before serving place the whipping cream, powdered sugar, Kirsch, vanilla, and optional dry milk powder in the bowl of an electric mixer. Whip the cream until it forms stiff peaks. Spread the whipped cream frosting over all of the cake. Decorate the sides first, then the top. If you want to be fancy, put some of the whipping cream in a Ziploc or a piping bag and pipe rosettes or swirls around top and bottom of cake. Pat the reserved cherries dry, and then place in a pretty design on top of the cake. Grate the chocolate bar or use a vegetable peeler to make chocolate curls. Gently, and decoratively press handfuls of the grated chocolate onto the sides of the cake. Thanks for stopping by my kitchen today, and I hope there is a Special Occasion coming up soon so you can make this cake. It’s a keeper! Just in case you are wondering, and in case you are reading this because you’ll also be hosting a book club meeting based upon “The Book Thief”, I also made Kipferls. Kipferls, which are significant in the book, were left by the window for people to take home (just like in the book). I’ll posted that recipe, too, since they were soooooo good (but soooooo expensive to make, more about that later). My book club does snacks and dessert. For snacks I had a bowl of apples, German bread with cheese and liverwurst, and soft pretzels with a beer-mustard-cheese dip (no picture of the pretzels and dip) and Stollen! To drink, we had champagne, of course. Those of you who read the book know why. I’m pretty sure this recipe will make my Top Ten list for 2012. It’s certainly the best recipe I’ve come across so far this year–and the one that has gotten me back into the business of blogging, which was no small feat. This is a delicious make ahead special occasion breakfast/brunch dish. Keep it in mind for Easter, Mother’s Day, Father’s Day, Graduations, as well as anytime you have overnight or early morning guests. My friend Karin made this at our Cookbook Club’s Snow Holiday. I ate it the morning she made it, and had it again for the following three mornings! Loved it. Karin learned to make this from her cousin in Germany who had made it for an Aunt’s milestone birthday celebration. The original recipe is full of German words, quantities stated in grams, and a few ingredients mentioned in the directions but not in the ingredient list, but we’ve fixed that for you. Truthfully, both Karin and I wouldn’t have made this if we hadn’t eaten it before reading the recipe. Cream cheese and eggs never appealed to me, and neither did the thought of eating cold omlette. Just overlook those things! Be smarter than we would have been. This recipe is a winner. Don’t hesitate to make it. Remember to plan ahead; make, assemble and roll this the night before your special occasion. Since I ate this for four days, I know it stays fresh and delicious for at least that long, but I probably wouldn’t push it much longer than that. Line a jelly roll pan with parchment paper and lightly spray with Pam or spread with butter. Sprinkle grated Parmesan cheese onto the parchment paper. Pour egg mixture carefully over the Parmesan cheese onto the parchment lined jelly roll pan. Bake at 375 degrees F. for 10 min. Remove cooked eggs from oven. Let cool in pan. When cool, flip omlette over and onto a long piece of plastic wrap. Remove parchment paper. Spread remaining softened cream cheese on top of eggs. Lay thinly sliced smoked salmon over the cream cheese, covering the entire omlette. Roll egg-cheese-salmon omlette tightly in plastic wrap–you can roll from either end, making a bigger spiral serving fewer people or a small spiral serving more people with lighter appetites– and place in refrigerator overnight (at least 8 hours). THANKS for stopping by my kitchen today. Aren’t you glad there was a new recipe posted? Me, too! I hope there’s another one tomorrow…or the next day.